Despite the Browning X-Bolt’s moniker, the 6in bolt remains the same: a three, upfront, locking lug arrangement. The lugs are arranged with one at 12 o’clock and the other two at four and eight o’clock. This provides a strong lock-up and support of the cartridge head when loaded and initiates a low bolt lift. At the front, set into the recessed bolt face at 10 o’clock, is the long extractor, which reliably extracts the spent case, while at two o’clock the plunger-type ejector flings the case clear of the action. The bolt body is polished, with three flat facets along its top profile, a rounded underside and a black nylon bolt guide to stop the bolt twisting. This makes for a smoother operation. This all rides in a 5in-long receiver made from stainless steel and finished in a subtle tone to enhance its non-reflective properties. The receiver has the square, flat-sided profile that defines the Browning range of rifles. What is different is the scope-mounting arrangement, which is called the X-Lock system, and incorporates four Allen-type screws to each base for a secure union between the action and the scope. The bases have a Weaver-type profile and will accommodate many universal scope mount rings to suit a variety of scopes. To the rear of the bolt is a cocking indicator to let you know the rifle has a round in the chamber and on top of the bolt handle, which has that curious Browning twisted flat bolt-knob, is a square plunger, which when depressed allows the bolt to operate even if the safety is on. The trigger is crisp and positive with a single stage operation that breaks at just over 4lb weight. The trigger-blade is smooth and silvered and there is an adjustment screw for the trigger weight, but this can only be accessed with the stock off. It is secured with red glue at the factory. Leave it alone – it works fine. Less fine is the large trigger-guard and internal magazine housing with a tacky silver finish, not stainless steel like the rest of the X-Bolt. The magazine is also made of synthetic plastic and has a rotary operation of four rounds in .243 calibre. It is released by a latch housed in the front of the magazine, which makes insertion and removal a doddle. There is also a spring tensioner to the rear of the magazine recess to stop any rattle. The safety catch is sited on the tang at the rear of the action and slides in operation in shotgun style. I like this, as it is easily accessed with the firing hand’s thumb and it has one position that locks both trigger and bolt operation. This is one area where the changes are more obvious, as the X-Bolt has a modern style and highly ergonomic stock profile. It feels right as soon as you pick it up. Most synthetic stocks have a cold, hard feel to them, but the X-Bolt stock has a soft, tactile feel, almost as if it has a nap on the outer shell, which provides more comfort and a better grip. In fact there is no chequering as such, only inserted stippling panels and a long, slender finger-groove to the fore-end. The pistol-grip is nicely raked to accommodate big hands and since there is no cheekpiece, the stock is almost ambidextrous to use. Despite it being a hollow stock with a rather slim fore-end, the length of pull at 13.3/4in did not seem too short and the ‘squishy’ black recoil pad helped. A set of stainless steel sling-swivel studs finished off the stock nicely. Cut to 22in, this .243 barrel has a one-in-10 rifling twist with a typical lightweight Sporter profile to reduce overall weight and has the same smooth non-reflective finish to the stainless steel as the action. The test rifle came with a well-cut muzzle for a 14mm x1 thread size, so you can attach a sound moderator without seeking any aftermarket services. The barrel is fully free-floated from the tip of the fore-end to the receiver bedding area, with enough latitude so that even a heavy sound moderator will not upset this crucial area. Further aiding the accuracy is the attention to detail in the action bedding area. The base of the action has a substantial stainless steel recoil lug that sits securely in a synthetic bedding material which extends to the front stock screw. The rear stock screw is open for most of its length to the magazine well, however. Thankfully, the hollow fore-end, which can cause accuracy issues due to twisting, has criss-cross braces to stiffen it. The X-Bolt proved a capable performer with a variety of loads. The hand loads outperformed the factory loads. The Remington 75-grain factory load suited the Browning, with 1in groups being the norm. 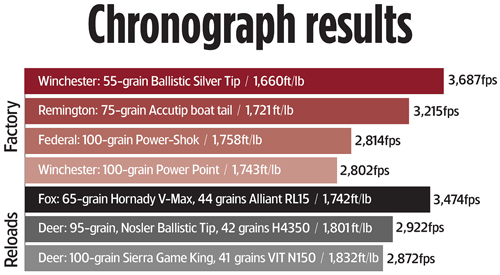 The best reloads shrank the group sizes to just under 0.75in for three shots at 100yards for the 100-grain Game King load, and 0.85in for the 95-grain Ballistic Tip load. The X-Bolt could unsettle competitors with its design and pricing. The magazine is practical, the bolt system is largely unchanged from the A-Bolt rifle and accuracy was fine for stalking. The Browning has practical stalking accuracy and performs best with the Sierra Game King reloads. 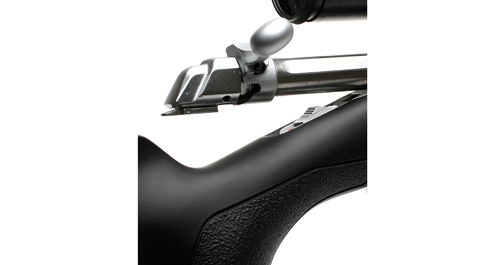 With great handling, the X-bolt sits solidly into the shoulder and has natural pointability. Though a little heavy, the trigger has nice crisp pull through and the single-stage operation breaks cleanly. The stock is one of the best factory synthetics on the market and is well-designed with a practical finish. For the price the Browning offers good features – I hope British shooters take notice of this rifle.